Spasms of Accommodation: There is no such thing as Girls' Science! That evolution video is on boingboing. I picked up this link from the first comment. Creationists can call me a show mare and I don't care, but THIS? This offends me to the CORE. 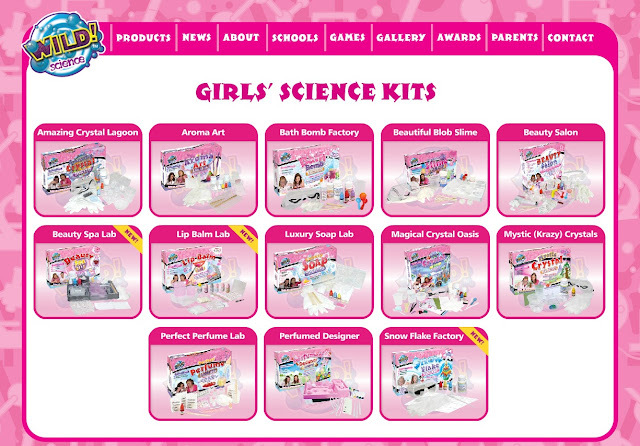 Girls' Science? What part of this is science?! It's the cosmetics aisle with a pink border! There is nothing that is not wrong with this. I think the Mystic (Krazy) Crystals offend me the most. Wait, there is one thing I can approve. They got the apostrophe right in Girls'. I threw up in my mouth when I saw this. I now want to strangle every person involved in the making and marketing of this offensive, belittling, nauseating, reprehensible, irresponsible, and ignoble product. Found this post through Marshmallow. It's one of the things that bothers me, too. That somehow we need to differentiate between boys and girls when it comes to science. Best example I have is leading a Girl Scout troop several years ago. We were given a science experiment as part of a focus group for the television show Zoom. We were to get a packing peanut to neither float nor sink in a large container of water. Did the words 'neutral buoyancy' appear ANYWHERE in the experiment? NO! We were making 'flinkers'. Things that neither float nor sink. I taught the right word to my girls. And pointed out that someone, somewhere thought they must be stupid. They were insulted. Flinkers is probably the worst thing I've ever heard. To their credit, the description for these kits do mention "Non-Newtonian fluids" and "capillary action" so they might not be that bad underneath the pink packaging.